Liquid assets are important in a company flow manage. After considering the own strategy related to charges and payments, the company has to take into account how to manage the cash. How to store it? This liquidity has today a very low return if it is stored in accounts or fix-term assets, because the interest rates are in historical low points. On the contrary, there are custody fees and at the end you can pay to keep your money safe instead of getting profitability of it. A portfolio strategy for liquid assets can be an interesting alternative. First of all, the company has to define the charges and payments terms and how much cash can accumulate averagely. This money can be saved in different portfolios depending the targets: for instance, a portfolio to manage salary payments, a portfolio to accumulate charges from a specific customer from who we are getting regular incomes… That should be defined depending the company business, the customer structure and the cash flow, amongst other ratios. We have the target (invest in portfolios), we have the strategy (how much money in which kind of portfolios), but now we need the tool. In T-Advisor, we have developed specific tools that help companies manage portfolios. What do you have to take into account when configuring it? The asset trend and cycle: watch out it, because if you build a portfolio to obtain a performance in a short term (for instance, a month), this point is highly important. The diversification: avoid focusing in only one kind of asset or market. With the time, you will manage the portfolios, helping yourself with alerts and modifying the portfolio composition with the optimizer. Our proposal is far from being weird. It is applied by lots of companies and it is possible to be applied in little and middle companies. As an example, read what an international institution is doing with its liquid assets: just what we have already explained you. In T-Advisor we have several model portfolios that could be an idea. 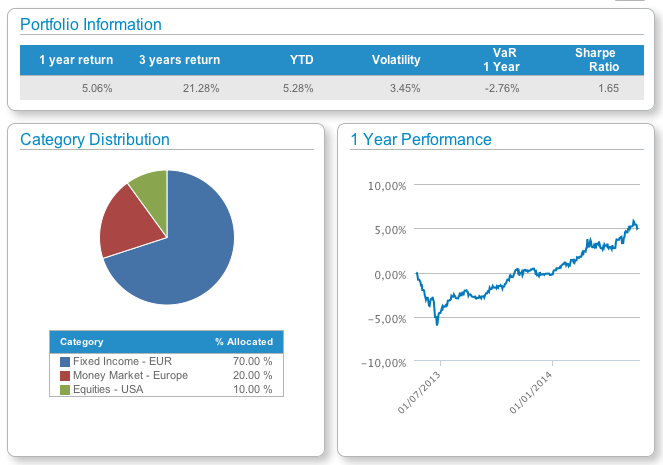 Our conservative portfolio has a 1 year VaR -2.73% and the return year-to-date is 5.28% (with an historical return of 21.28% in the last three years). This entry was posted in News and tagged Liquid assets, portfolio strategy, profitability on May 22, 2014 by Oscar Garcia.